When I first started this journey, I was the traditional financial advisor working with baby boomers on the verge of retirement. Today, many of those clients have been with me for nearly a decade, and business relationships blossomed into friendships, and I wouldn’t trade that for anything. Fast forward, and about five years or so ago, I started to take an interest in working with the younger generations (aka my generation). It was tough at the start because others said that you couldn’t work with Gen X & Gen Y because they don’t have “enough” money. Well fortunately for me I stumbled upon a group of like-minded young financial advisors challenging the status-quo. They were working with Gen X & Gen Y, but instead of billing on assets they were using flat-fees (or subscription models). This allowed two generations, which I argue have more complicated plans than baby boomers, to get access to financial planning while having a low net-worth, or heck, many times a negative net-worth with their student loans. Why did I say Gen X & Gen Y have more complicated plans? Well for starters, I have built plans for both, so I am just speaking my opinion. For many of our boomer clients, they are in the decumulation phase, and while the investment management can be a bit more complicated, the actual financial plan starts to calm down. Many of our boomers were hard-working individuals, saved up a good chunk of money, have a solid pension and benefit from a functioning social security system. Long story short, a lot of the moving parts are starting to slow or have stopped. Gen X & Gen Y: What have we seen? Clients with student debt well over 6-figures, clients getting married, clients having babies, clients buying their first home, clients buying their first vacation home, clients with restricted stock units (RSU) and employee stock purchase plans (ESPP), clients changing jobs multiple times in one year, clients that will never have a pension, clients that may see a drastically different social security system than what we see today, clients planning for private school from K-12 for their kids, clients figuring out their best way to save/pay for their kid’s college, clients wanting to go part-time before 40, clients wanting to retire by 50, and countless other items to plug in here. Heck, sometimes the hardest part is just tracking down the proper employer benefits for clients. Point being, there are more moving parts which usually leads to a more complicated plan but also more plan updates for life’s course corrections. So if you are part of the Gen X or Gen Y group what are some tips to get you started? 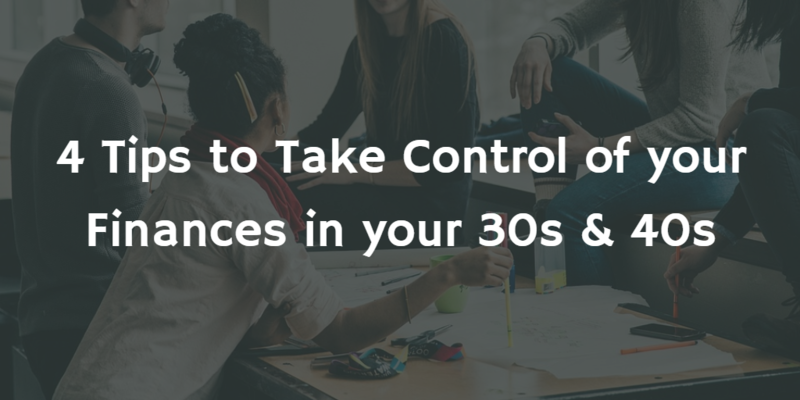 Your 30s and 40s can really sneak up on you in terms of your finances. One day you’re “YOLO’ing” as a 20-year-old and then BOOM, the next day everyone is asking you why you haven't gotten around to opening up a 401(k) yet. No worries, we have good news, saving money doesn't necessarily have to be a difficult or mystifying riddle you have to solve immediately. However, regardless of how much money you make or how much debt you have, try to get this thing going sooner than later. Pro Tip: It only gets more difficult the later you start, I have built 100s of financial plan by this point, and I promise, it does not get any easier to get started. While you may be many years removed from school, it doesn't hurt to do a little homework on your finances. This is a good (if sometimes difficult) time to consider checking your credit score [Pro Tip: Many credit cards today will provide you with a free FICO score] and making plans for what it is you want out of life. Whether it's to buy a home in five years or pare down your student debt by 15 percent, it helps to have solid, definable goals. If you choose to go this route, design your goals to be ambitious without abandoning reality completely. It can be helpful to take a break for a few days before coming back to the table to decide how you're actually going to go about managing your money to pursue your goals. Your 30s and 40s may still seem a world away from retirement, but ignoring the impending event will only make things worse once you turn 50. Baby steps are okay here, if you employer offers a match on your retirement plan, at a minimum make sure you are saving enough to get the full match. After that, try to hit 5%, then 10%, then 15%, and then, bare with me, 20%! Pro Tip: Put those pay increases into a retirement account rather than allowing them to become absorbed into your regular income. So, if you get a 3% bonus, try to increase your 401k by 1-2%, in the end, you still take home more money, but you also avoid living in a box and eating trash as your retirement outlook. Don’t get overwhelmed with investment options, there should be a 401k representative or a customer service rep to help you, and a good and easy option could be selecting a target date fund that coincides with your desired retirement year. What the difference better a 401k and a Roth 401k? Use this article. Just start saving, your “bestie” is compounding interest! Video help, click here! Last but not least, don’t be scared of the stock market for your long-term accounts. Yes, you will see some crazy ups and downs, but remember you can’t even touch this money for 30-40 years. Keep calm, and carry on. If you have read my posts before, you know that I think emergency funds are one of the most important items EVER! So with that said, one of the biggest things you can potentially do when you manage your money is to start stashing money away for emergencies. How much? Well, let’s take it in baby steps again. If you are at $0 today, goal 1= $1,000, goal 2=$5,000, goal 3=$10,000, and goal 4=$20,000. $20,000 should cover everything in an emergency event; if it doesn’t, you may want to check your insurance policies. Usually we like to see a much larger number (3-6x monthly net income), but we earmark that as liquid and are okay using accessible investment accounts (like a taxable individual account or joint investment account). Here are some other notes on this topic: Emergency Funds. The goal is to cut down on the impact a catastrophe will have on you and your family, and avoid defaulting to a high-interest credit card(s). From car breakdowns to a loss of income, you never know when you're going to have to handle unexpected financial demands. When all else fails, make a list! If finances still feel foreign to you today, start making a list of what you earn (aka your paycheck), spend (aka your budget) and what you save (Can be to a bank account or an investment account). You don't have to be a numbers whiz to start identifying what you can cut down on and which accounts you could be focusing on. Once you have a base idea of where each penny is going, you can start making changes to manage it all a little better. Here is a post I wrote not too long ago called the “The Simple Financial Plan in 9 Steps.” This should be a great starting point for you, some of the topics above are covered in this post as well (cash flow, emergency funds, savings), but there are also a lot of other items I cover like, paying off credit cards, disability insurance, and life insurance. Financial smarts aren't something that you learn once and then implement immediately. It's a lifelong skill that you'll likely still be trying to master in your 80s and 90s. Starting sooner rather than later can really make it easier on your future self. If you don’t want to learn this on your own, delegate it to a financial planner. There are plenty of great financial planners who can help you get this all organized and give you a blueprint to follow for years to come. It can be a one-time engagement or an ongoing relationship, and if you don’t like that idea, don’t be scared to do it on your own. Truthfully, I don’t think personal finance is hard, the hard part is the time commitment to make sure you are doing it right. Our clients are all very smart individuals, but they opted to delegate this task to us so that they can focus on things they enjoy (family, friends, hobbies) and their work.